Click here to go to the UK Taboo Games page. For four or more players. Includes word cards, buzzer, timer. Recommended age: 12 years and up. 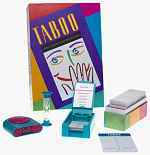 Special 10th Anniversary edition of classic game Taboo. Kids' edition of classic game Taboo. Words specially selected for kids. Includes word cards, squeaker, timer, and progress scoreboard.